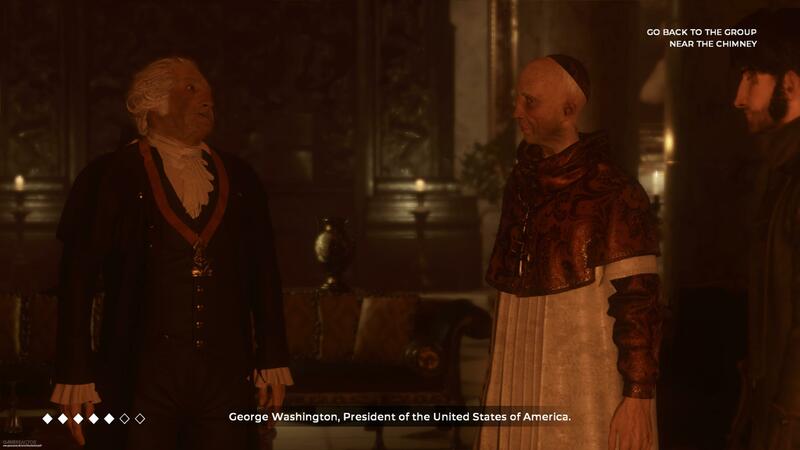 "A episodic adventure involving important people in history"
The Council is not your average point and click game like the one from Tell Tall or Artifex Mundi that we as gamers have become accustomed to on Xbox One. The Council takes the point and click adventure and adds its own RPG elements, dialog encounters, and levels of mystery that keeps you wanting more. There are many different paths and although they don’t seem to make much difference but the game rewards you for interactions with different characters. The game has it’s up and down and it isn’t perfect, but no game is, but it still remains a refreshing take on the narrative adventure formula. This game story is memorizing. I was amazed how much I wanted to know what happens next even after the first episode concluded I just wanted more. Basically you’re mother goes missing without a trace at a mansion on a private island. You play as Louis de Richet and your task is to find out what happened to her and where she has gone. Sarah de Richet aka the mother, is the leader of a top secret organization called the golden order which Louis is also a member of this secret order and finds out along the way that he is not the only one at this party that is. The likes of George Washington, Napoleon Bonaparte, Elizabeth Adams, and others join the cast of as you try and figure out if they have anything to do with your mother’s disappearance as everyone seems to know her. The gameplay is exactly what you would expect. You go around interacting with different people, collecting multiple different items, and solving disputes and using clues to complete your quests. While you can useless coins (well useless in episode one at least) there are some very useful collectables you can grab. There are books that help boost certain skills and consumables that have one of 4 effects which are: The next skill you use has no energy, see whoever you are talking to immunity’s and exploits, an item to get rid of all negative effects, and a item that gives you back two energy. Speaking of energy you can collect amber and 4 pieces of amber get you another energy box you can have. Using skills require energy whether that be to convince someone you are right in a confrontation, find a new clue, or solve a minigame and runs out fairly quickly so it is best to be careful with how you use it. One of my favorite parts of this game was the confrontations with all the different characters. You had to exploit their weaknesses and make sure to not use certain skills that are immune to get the result (and achievement you wanted) all included is a talent system. Doing the requirements for a talent gives you a permanent bonus to one or more of your stats so you want to do as many as you can. The characters are at their best during these dialogs and honestly it’s the only voice acting worth talking about but we will get to that. This game is a very engaging experience and makes me want episode 2-5 tomorrow so I can play all of them back to back. They aren’t bad but they aren’t amazing. It’s a very stylistic approach and it my option it pays off. I really felt like I was in a comic book and the drawings were coming alive around me. Nothing is short of perfection unless you go towards a door to the outside that is unopenable. If you head towards one of these many doors your character may get stuck in them and you will be forced to restart the game. I did have a couple of frame rate drops but nothing to bad but enough to find itself this low on our scale. The one thing that stood out to me was that the cutscenes transitioned right into gameplay and vise versa. The only loading screens in the whole game are when you leave an area for another one or between chapters and they last less than 5 seconds. It’s a very well put together game and just needs some tweaks to push it up to a 7 or an 8. Geroge Washington talking to you and the priest. Ahh sound. The one place this game completely fails. It’s not so much the music or sound effects in the actually game it’s the voice acting and lack of emotion shown with most characters. Now there are some exceptions to this like Elizabeth Adams who portraits the words and actions that are being shown through her with her voice. When it comes to just about everyone else though no one shows any emotion whether that be surprise, fear, happiness, sadness, etc. For example there is a scene in the game where Elizabeth Adams is acting hysterical saying someone is after her and they are going to kill her and the character you’re with just goes, “Meet me in your room later” and then Louis says, “Elizabeth it is not a good time sorry.” This women is obviously scared for her life and neither character batted an eye. Also, small spoiler, SPOILER ALERT if you don’t go with Elizabeth she is found dead the next morning and your character shows absolutely no guilt in the slightest. END SPOLIER ALERT. It’s this disconnect from human emotion that really made the game backpedal with what it was trying to do. It almost had me not care what happens to these characters as they almost seemed like robots at some point or another. I hope they fix this on upcoming episodes as it will make the game ten times better then what it is. Your words vs. a pistol, which one wins? While it is not a hard game at all there are a couple of puzzles that if you don’t have the right skills or didn’t grab the right clue will put you through the ringer which makes you want to find those clues and do everything there is to do. However at the end of the day the game remains very easy and I’m fairly certain a child could finish it. There isn’t much here difficulty wise. What’s great about the achievements present in this episode is that all of them, despite the story based achievements, are linked to a talent you can unlock to make your character better at certain skills. Now you can’t unlock all the achievements in the frist run but it’s simple enough to load up the other chapter and go do the achievement you missed without messing up your save, which is nice. Now you don’t get to keep the talent points you get from replaying chapters so it is impossible to get them all, but that’s a different topic. I loved the achievements in this first episode and I didn’t mind getting them it was interesting to see what would happen if I picked a different route. You can complete this episode in just under 3 hours as long as you spend your points right but if you are like me you prolly won’t get the achievement to get a skill to level 3 but I’d imagine it will be easier as more episodes drop. 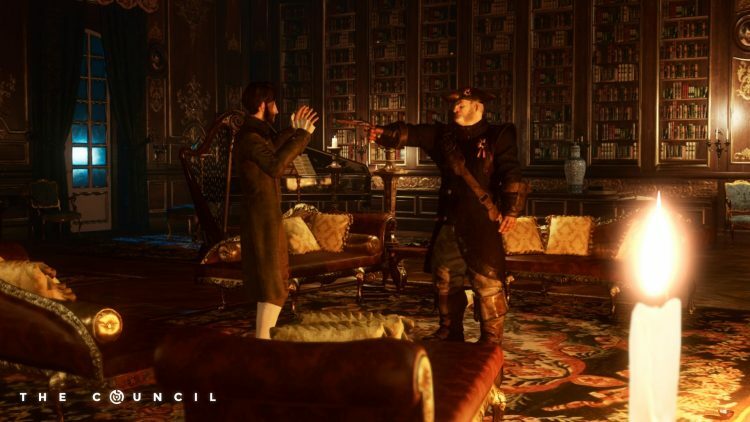 The Council Episode 1: The Mad Ones is a delightful game that is surrounded in mystery. Despites its awful and lackluster voice acting I did really enjoy this game and couldn’t wait to jump into future episodes to see what happens. From the prologue all the way to the credits I was hooked and honestly I wanted to play the whole thing again with different skills to see if the outcome was any different despite their being no achievements to get. I’d say the first episode is defiantly worth what they are asking and that any fan of narration or story will find a home here.